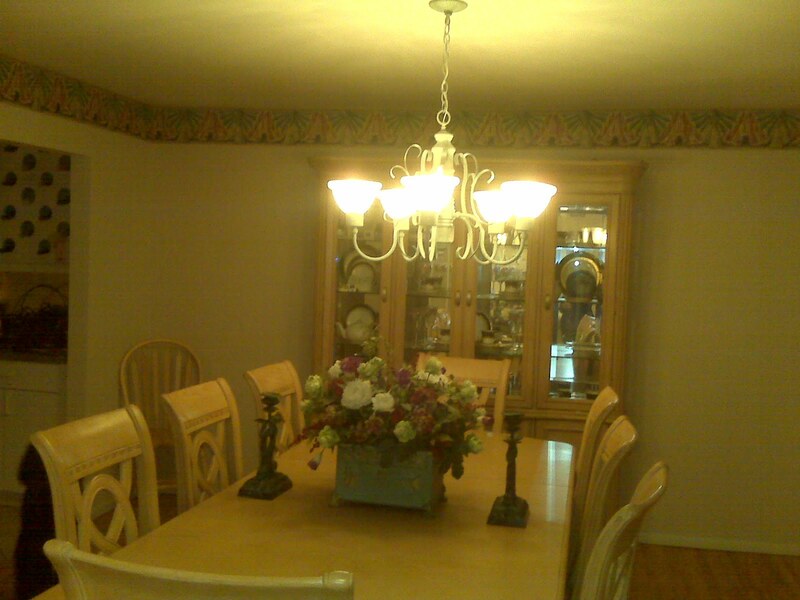 Your favorite Rockstar "Paintergrrl" finally got to pimp out the Diningroom in this pad. Here's what it looked like when we walked in. Not good, right? 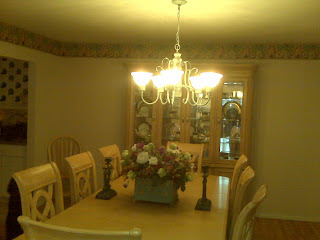 The chandelier was verdigris green, and there was a dreadful wallpaper border (which should be illegal) around the room. We decided that the room, right off the main foyer, needed some pattern to really rock. A quick base coat of "Satchel", appropro for The Shoeman's crib. Then your loyal Warrior Princess worked her magic. An all-over stencil pattern of "Iron Gate". Yes...it's true, that is all paint. (Even The Fabulous Wallpaper-Hanger was impressed...* More about him later...) Everyone was thrilled! Day One of Houseboat S.S. "Charisma"....nee. "Queen of Hearts" renovation. This is the Houseboat bequeathed to me by The Pirate of Centerport. This fine vessel is hard aground...from the late 60's, and in dire need of a gentle, helpful Rockstar hand. I quickly set up command central on the Fore Deck...handbag, Mother's old cushions, blackberry, and trusty iced tea. Wall colors have been chosen, windows have been measured...a meeting took place about how to proceed with certain repairs, and cleaning issues...Over all, a brilliant day!